Kilburn has amorphous borders. Estate agents will do anything to avoid labelling a street as being in Kilburn, so it’s rather refreshing that someone at the very top of their game, someone kids should look up to, someone who calls it like he sees it; that someone like that should identify himself with Kilburn. 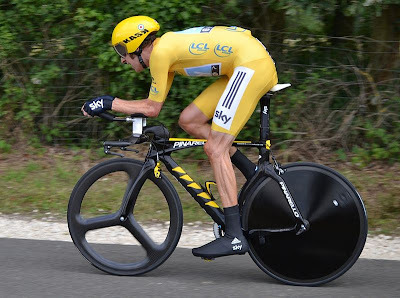 I’m a bit older than Bradley Wiggins, the first British winner of the Tour de France [and now 4 times Olympic champion], but, like him, my schoolboy bedroom walls were covered with photos ripped out of Cycling Weekly. My heroes were Greg LeMond and Robert Millar; Richard Virenque and Laurent Jalabert; Charly Mottet and Tony Rominger. For more than 25 years I’ve cheered on these riders on television, or from the side of the road. In short, I really love pro cycling despite all the depressing news that often surrounds it. This also means that like all cycling fans I’ve known about Bradley Wiggins for many years. After all, he won his first Olympic medal in the 2000 Sydney Olympics and is tied with Steve Redgrave as Britain’s most medalled Olympian [now of course he’s overtaken Steve but is behind Chris Hoy]! He’s always been a bit of an oddball mind you – especially when compared with the clean cut superhero figure of Chris Hoy. Wiggins is a bit irascible, a rider with incredible lungs and an incredible heart. He’s not a smooth media operator like Lance Armstrong. He doesn’t read off the script. He is, as has been cited ad nauesum in the press, the self-styled “kid from Kilburn“. When it looked as if Wiggins was going to fulfil his promise as pre-race favourite, journalists delved more seriously into his Kilburn background. He wrote in his autobiography that he grew up in Paddington, while acknowledging that everyone called it Kilburn. The press are interested, I guess, because people tend to have a very definite impression of Kilburn – and it’s not one that you’d associate with incredible sporting prowess although there’s really no reason why you shouldn’t. 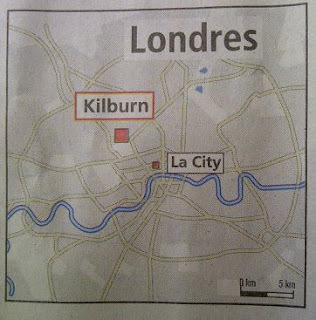 But Wiggins has quite literally put Kilburn on the map. Revered French sports paper L’Equipe had to show its readers where Wiggins grew up. He himself was quoted in the French press over the past few days saying that people from Kilburn end up as postmen, milkmen, or worked in Ladbrokes. Not winners of the toughest cycle race there is. Not that Kilburn – wherever its borders may be – can claim to have played a large part in his success. At St Augustine’s school he was good at sport but played football. It was his mother who fostered his cycling. Wiggins wrote that no-one at school had any idea he was into bikes, even when he became British schoolboy champion in the points race in 1995. In 2002, Wiggins moved to France spending six years with various French teams, even though he was far more famous for his exploits in a Team GB vest careering round the track. He speaks fairly fluent French – not bad for the boy who wasn’t noted for his academic abilities while at St Augustine’s. Since news broke of Wiggins’ Kilburn ties, there has been a lot of good natured chat with people who live across the border in W9 a.k.a. Maida Vale. They point out, quite correctly, that he actually lived and went to school in Westminster (although St Augustine’s is linked to a parish that straddles Westminster, Camden and Brent). His mother still lives in Dibdin House, where Bradley grew up, and she and Wiggins’ half-brother both work at St Augustine’s today. No-one seems to have found out how he ended up competing for Camden in the London Youth Games. Politicians are never known to miss a passing bandwagon and there is a call from one councillor for Wiggins to be given the freedom of Westminster. Hard to believe he’d be interested. There are calls for streets in the area to be named after him. Nice idea I suppose. There is quite a groundswell of support for him to ride down the Kilburn High Road in some sort of parade. I confess I rather like this idea – not least because for someone who grew up at the intersection of three boroughs, this would give a nod to them all. But also because he’s definitely captured the imagination of locals, and maybe he might just inspire the next kid from Kilburn. But lets remember this is a man who has settled in Eccleston, Lancashire and who trained at Herne Hill velodrome. Young Bradley wasn’t time trialling up and down the A5 behind the 98 bus; and if the school wasn’t helping him further his cycling ambitions, then I’m not sure local politicians from today or from the 1990s can bask in Wiggins’ reflected glory. Of course I’ve engaged in some of this back and forth over Wiggins’ Kilburn connections – and was amused to read that his parents briefly lived on West End Lane before Bradley was born. Such things are entertaining. But I really don’t care. 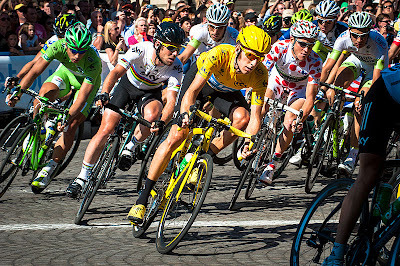 I’m just delighted that after 25 years of watching the Tour de France, someone who is quintessentially English – forget the Australian father and the Belgian birthplace, he’s a mod for christ’s sake! 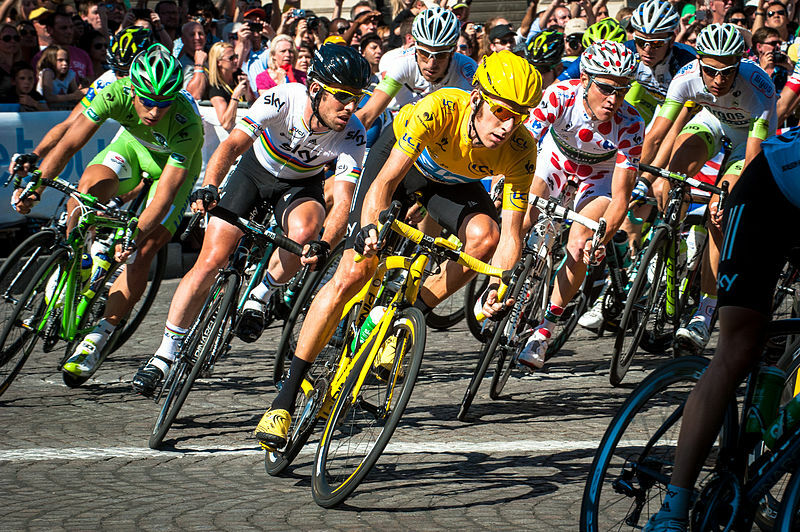 – has lived up to his potential and conquered the quintessentially non-English Tour de France. Bradley Wiggins the cycling champion from Kilburn wins the Tour de France Will West Hampstead get free WiFi?